We are always hungry for more processing power. Whenever we buy computers, we always look for the ones with higher configuration. The computer manufacturers thrive to give us more speed and processing power at lower costs so that they can differentiate themselves from their competitors. With the emergence of so many technologies, our need for processing power is increasing by the day. Moore’s law states that the number of transistors on a microprocessor will double every 18 months. This law has been more or less true up until now but it is getting saturated. So we need to look into a different direction if we want to keep up. Quantum computers can perform calculations significantly faster than silicon-based computer. So what are quantum computers? How can they perform calculations so quickly? As we all know, computers understand only 0s and 1s. What this means is that everything has to be converted to bits and computers will then interpret this to perform the necessary actions. A bit can have two possible states: 0 and 1. A bit is stored on a transistor and every transistor consumes space on the microprocessor. When they fit more transistors onto the microprocessor, they can fit more processing elements and information. Let’s say you want to represent black and white colors using bits. You can say that 0 refers to black and 1 refers to white. So if you want the computer to understand this, it’s quite straightforward. You can use one bit and the value of that bit will point us to the color we want. Now consider a case where you have 8 colors: white, black and 6 different shades of grey. Would one bit be sufficient? No. We will need 3 bits to represent this. If you have 3 empty boxes, then you can fill them up in 8 possible ways with 0s and 1s. Each combination can refer to a particular color. We wanted to store more information, hence we needed more bits. This will keep increasing as the amount of information increases. What if we have something that has more than two states? As in, instead of just 0 and 1, it can have 0, 0.2, 0.4 etc. If we have something like this, then we wouldn’t need 3 bits to store 8 colors. This is where quantum computer comes in. How does a quantum computer process information? The basic processing element in a quantum computer is called qubit (quantum bit). A qubit can be 0, 1 or any combination of these two states. This is called Quantum Superposition. In reality, this is achieved using sub-atomic particles and their spins. Since a quantum computer can exist in multiple states simultaneously, it can be a million times faster than the fastest supercomputer we have today. This also provides inherent parallelism to quantum computers. Parallelism allows a quantum computer to work on many different things at once, thus speeding it up by a huge factor. Quantum computer also utilizes a property known as Quantum Entanglement. This is more on the physics side of things. Sub-atomic particles are not very stable and they are kinda shy too! If we make an attempt to look at them and measure them, they will quickly change their states. It means that if we store something on a quantum computer, we cannot just directly read it back. Hence we pair a qubit with another qubit, which we can see and measure. In quantum physics, if you apply an outside force to two atoms, it can cause them to become entangled. Entanglement refers to pairing. The second atom takes on the properties of the first atom. We are measuring the value indirectly here. This allows scientists to know the value of the qubits without actually looking at them. 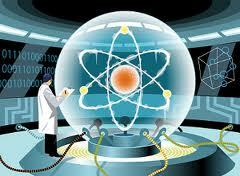 The potential of quantum computing is huge. This blog post describes the basic premise. I will discuss the applications in another post. In the last decade, there have been several meaningful attempts in this direction and people have come up with a working model. This field is still in its infancy and we are still far away from creating a practical quantum computer. If constructed, the most basic quantum computer will be more powerful than all the computers in the world working together in parallel! This entry was posted in Computing and tagged Computer, Computing, Entanglement, Parallel Processing, Quantum, Superposition by Prateek Joshi. Bookmark the permalink.